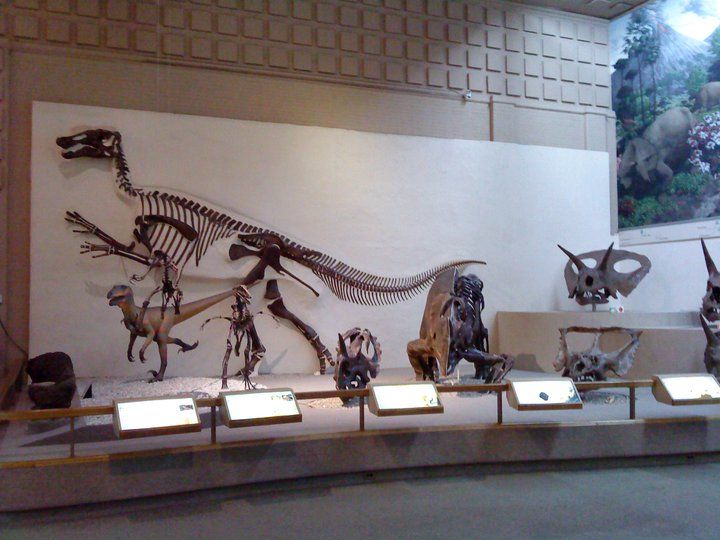 Readers are likely aware that the Hadrosaurus Benjamin Waterhouse Hawkins created for the Academy of Natural Sciences was the first mounted dinosaur skeleton. It is less widely known, however, that this Hadrosaurus was a plaster facsimile, which included none of the actual fossils that inspired it. (edit: not quite, see comments). 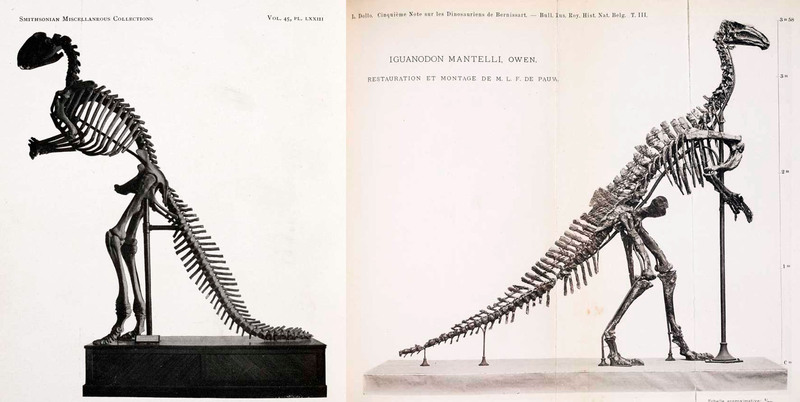 The title of first dinosaur mount composed of original fossils belongs to the Belgian Iguanodon assembled by Louis Dollo in 1891 (I should probably write about this eventually, but Fernanda Castano has an excellent account at Letters From Gondwana). So what was the first real fossil dinosaur mount on this side of the Atlantic? Glad you asked – that would be none other than the 1901 Edmontosaurus at the Peabody Museum of Natural History. 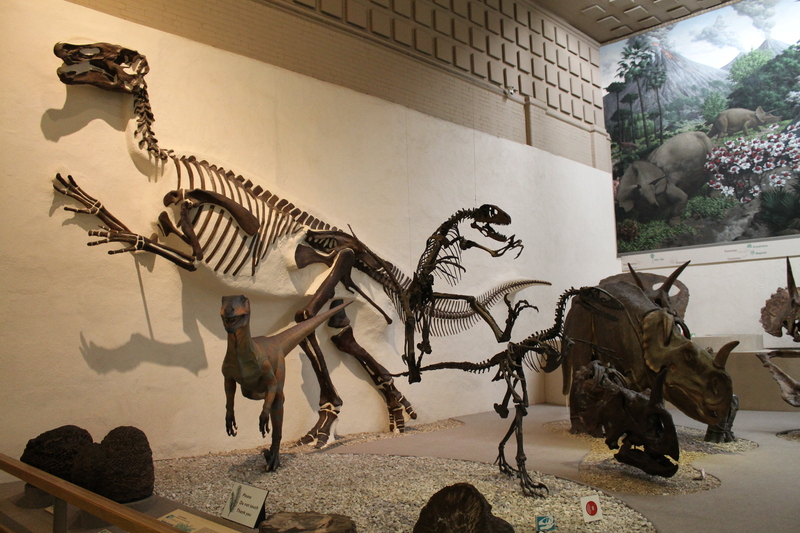 The PMNH Edmontosaurus with Deinonychus and Centrosaurus. Photo by the author. There are plenty of Edmontosaurus skeletons on display today, but the Yale mount is noteworthy because of its remarkably modern appearance. While the Hawkins Hadrosaurus and Dollo Iguanodon were upright tail-draggers, the Edmontosaurus could be mistaken for a mount constructed in the last quarter century. Its raised tail, horizontal posture, and energetic gait all reflect current thinking about dinosaur posture and locomotion. And yet, it was built at the turn of the century, back when paleontologists supposedly all thought of dinosaurs as lethargic lizards. The Hawkins Hadrosarus and Dollo Iguanodon. Images from Paper Dinosaurs. The scientist behind this mount was Charles Beecher. Born in Pennsylvania, Beecher studied at the University of Michigan before taking an Assistant of Paleontology position at Yale in 1888. He completed his PhD under Marsh, who apparently thought highly of him (and Marsh didn’t think highly of many people). Although his preferred research subjects were Paleozoic invertebrates, Beecher could be counted on to help prepare his mentor’s vast collection of dinosaur fossils, when needed. When Marsh died in 1899, Beecher succeeded him as the head of the Peabody Museum, and set himself the task of mounting one of the institution’s best dinosaur specimens for display. Beecher selected YPM VP 2182 as the Peabody Museum’s first fossil mount because it was nearly complete and mostly articulated. Known to Marsh and Beecher as “Claosaurus” annectens*, this Edmontosaurus skeleton was collected in Wyoming by John Bell Hatcher (because of course it was). Beecher and assisting preparator Hugh Gibb attempted to preserve the fossils within their original matrix as much as possible. Since the specimen was somewhat laterally compressed, Beecher kept the right side mostly in situ and built up the left in high relief. The head and neck were technically never removed from their matrix block, but since the head was found curved under the body it had to be rotated into its life position. All told, only the right ribs, the corocoids, the final two-thirds of the tail, and some of the vertebral processes were reconstructed. No attempt was made to restore the ossified dorsal tendons, which were poorly preserved on this specimen. The complete mount is 13 feet tall and 29 feet long, its tail extending past the edge of the 27 foot slab. For a few years, it was the largest fossil mount ever built. The slab itself is made up of original matrix blocks sealed together with a manufactured surface created from plaster, resin, and ground Laramie Formation sandstone. It was assembled in four pieces secured to wooden frames. These were designed to be separated and moved with relative ease, although PMNH staff have yet to try. Much like the AMNH Gorgosaurus, the Yale Edmontosaurus demonstrates that early 20th century paleontologists’ supposed aversion to energetic and agile dinosaurs has been grossly overstated. 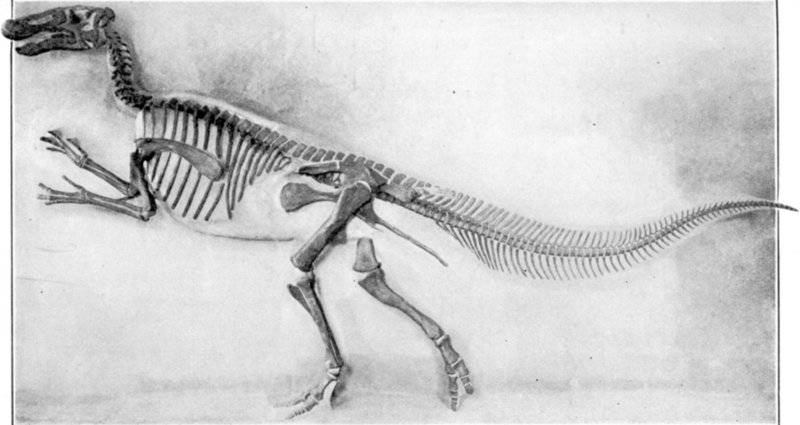 Beecher saw Edmontosaurus as a powerful, active animal, and actually criticized the earlier reconstructions by Hawkins and Dollo. He correctly pointed out that the back-swept ischia of ornithopod dinosaurs would not allow room for the drooping tails they had reconstructed, and also noted that fossilized dinosaur trackways never show the mark of a dragging tail. Beecher died suddenly in January of 1904, and the Edmontosaurus display ended up being one of his final professional accomplishments. Despite the relative dearth of dinosaur material available at the time, Beecher’s careful and impartial study of the available evidence allowed him to reconstruct this animal in a way that is still considered accurate 114 years later. Beecher’s work shows us that old research isn’t necessarily outmoded. Good science can come from any age and any source, if one only takes the time to look. *Today, the genus Claosaurus is reserved for Claosaurus agilis from Kansas. The referred species annectens has since been placed in Thespesius, Trachodon, Anatosaurus, and now Edmontosaurus. Jackson, R.T. 1904. Charles Emerson Beecher. The American Naturalist. Vol 38, No. 450. Marsh, Othniel C. 1892. Restorations of Claosaurus and Ceratosaurus. American Journal of Science. Vol. 44, pp. 343-349.